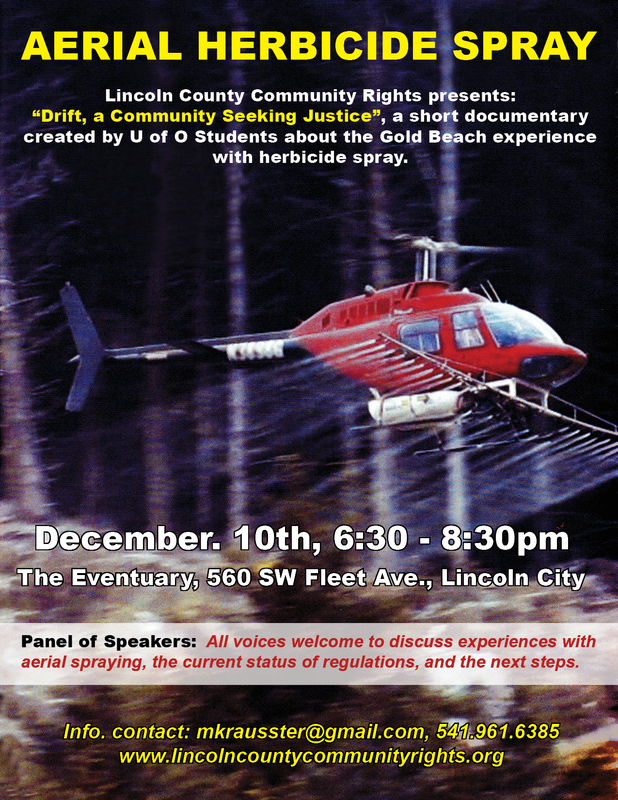 Pacific Rivers’ award-winning documentary about the effects of industrial logging and herbicide spraying of coastal forests on our communities and environment, followed by comments from members of Lincoln County Community Rights and a discussion with the audience. 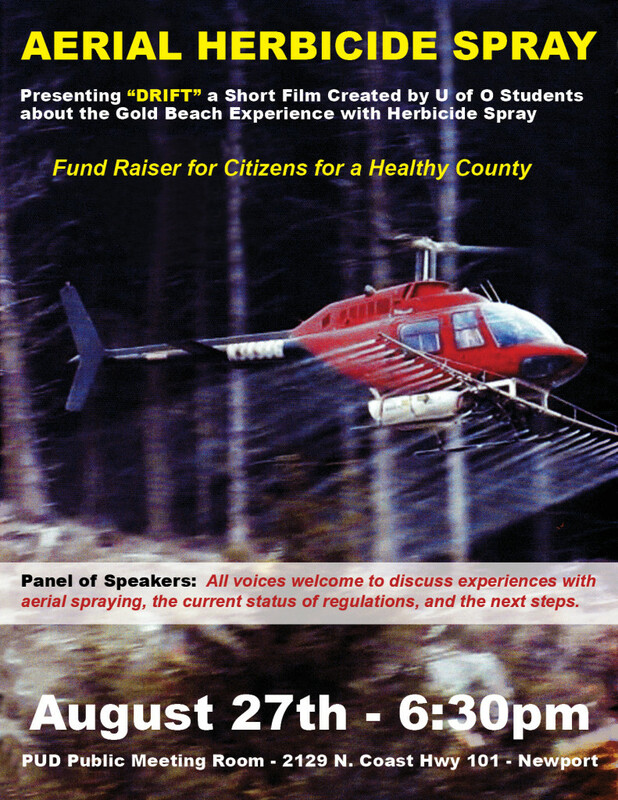 Citizens for a Healthy County, the Petitioning Committee for Lincoln County Community Rights, has filed an ordinance banning aerial pesticide spraying in Lincoln County. The County has approved the ordinance, but a private timberland owner has filed a lawsuit against it, in spite of the well-publicized risks to the health of our people, ecosystems, water supply, air and soil posed by aerial pesticide spraying. That lawsuit needs to be resolved in our courts before we can be authorized to gather signatures to put our ordinance on the ballot. The attorneys working on this case, on our side, the County’s side, and Petitioner’s side (the side objecting to our ordinance) presented their oral arguments on February 29th. The judge is taking time before issuing a ruling on the case. This court case will end up in a decision on our fundamental right to ask the voters in our county whether we should allow timber and chemical corporations to poison our ecosystems and the water, air, soil that are essential to the health of all life in them, including ours. OUR INITITATIVE DOES NOT DECIDE ANYTHING. IT ASKS THE VOTERS TO DECIDE ON A QUESTION ABOUT OUR CONSTITUTIONALLY GUARANTEED RIGHT TO SAFETY. AERIAL PESTICIDE SPRAYING IN NATIONAL FORESTS HAS BEEN BANNED FOR 30 YEARS! AERIAL PESTICIDE SPRAYING IN PRIVATE AND STATE-OWNED FORESTS TAKES PLACE FOR PROFIT! OUR HEALTH AND THAT OF OUR ENVIRONMENT AND ECOSYSTEMS ARE AT STAKE! LET THE PEOPLE, NOT CORPORATIONS DECIDE! MARCH 11, 6 PM, Yachats Commons Room # 8. 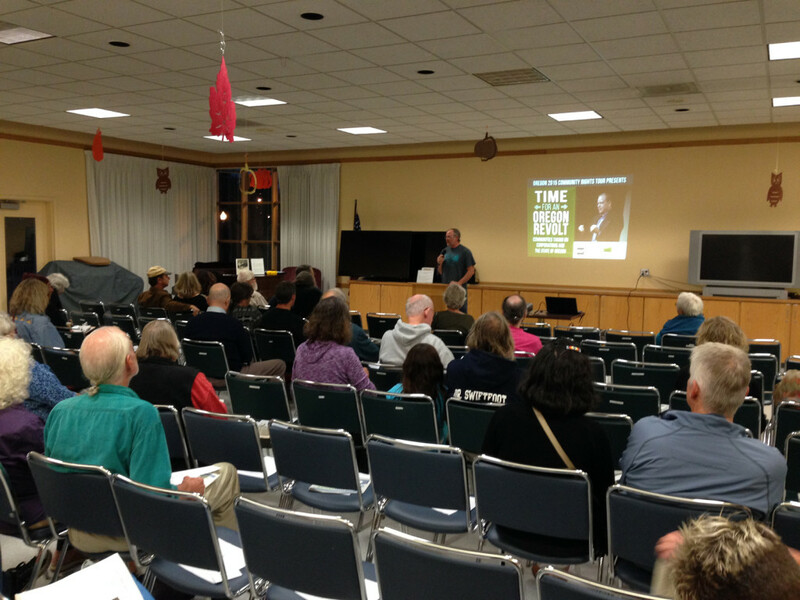 We were very fortunate to have Thomas Linzey, Founder and Executive Director of CELDF, the Community Environmental Legal Defense Fund, in Newport on October 5th. 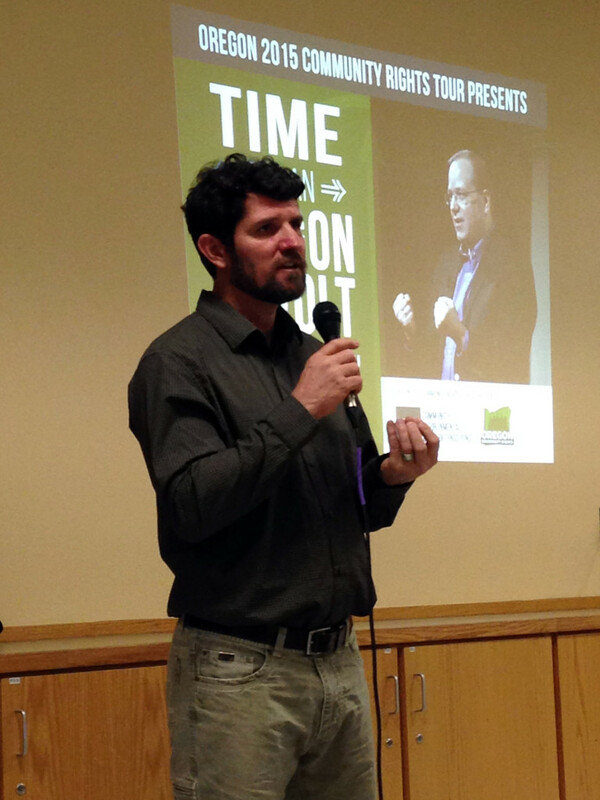 During his “Oregon 2015 Community Rights Tour”, both he and Kai Huschke (CELDF’s Northwest Organizer) made Newport their third stop in their tour of six Oregon counties. Published by admin, in CELDF. 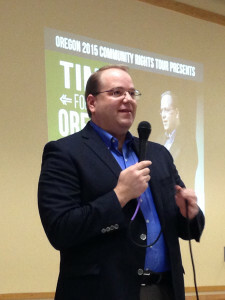 Lincoln County Community Rights and its umbrella organization, the Oregon Community Rights Network, are bringing you a talk by Thomas Linzey, founder of the Community Rights movement and the Community Environmental Legal Defense Fund, helping communities nation-wide to assert their fundamental rights guaranteed by the constitution at the local level. October 5th, 7-9 p.m., at the Newport Senior Center, 20 SE 2nd St. (across the street from the Newport Rec Center). If you have any questions, please call 541 961 6385, or write mkrausster@gmail.com.